By 2040, many of Brazil’s existing and planned hydropower projects, including those in the Tapajós basin, could become unviable as drought worsens and river flows decrease. Severe droughts that turn hydroelectric power stations in the Amazon into white elephants. Epidemics of dengue fever, malaria and leptospirosis. Heavy crop losses. These are some of the possible scenarios for Brazil in 2040 according to the largest climate change study ever carried out in the nation. Entitled “Scenarios and Alternatives for Adaption to Climate Change”, the study was undertaken by the SAE (Secretariat of Strategic Issues), a powerful institute that forms part of the Presidency of the Republic. As SAE states on its website, “it commissioned institutions of renowned competence to draw up simulations as to what Brazil’s climate could be like, according to global climate models”. SAE’s objective was to foresee how climate change could affect the country’s main economic sectors and to suggest strategies for increasing the resilience of the affected sectors. Given the importance of the report, it was published with surprising discretion at the end of October and might have passed unnoticed, had it not been for the watchful eyes of the OC (Observatório do Clima), a civil society network that promotes discussion on climate change. OC had already reported in March of this year that the two scientists coordinating the study — Sérgio Margulis and Natalie Unterstell — had been sacked, though almost a dozen groups in the country continued working on the study. OC interpreted the firings as a decline in the importance of climate change in the government’s priorities. Other indications of failing government interest may be the delayed publication of the study, originally planned for last April, and the lack of fanfare at publication. The new study brings together two climate models — broad brush data from the UN’s IPCC (Intergovernmental Panel on Climate Change) and more detailed information from Brazil’s INPE (National Space Research Institute), which zooms in on South America. Using this data, the study produces two simulations. One, entitled RCP 8.5, assumes that the world carries on as now, doing little to control 2° Celsius (3.6° Fahrenheit) emissions; and the other, called RCP 4.5, assumes efforts to control emissions, but not energetic enough to keep global warming down to 2° Celsius, regarded by scientists as the ‘safe limit’. Under both scenarios, Brazil becomes a hotter and drier country overall, though there are regional variations, with the south receiving more rain, while the Amazon and the northeast get considerably less rain, particularly in the summer. In one of the studies commissioned for the report, a group led by Francisco de Assis Souza and Eduardo Martins, used rainfall predictions to construct a model to assess the impact on the country’s hydroelectric output. Hydropower is important for Brazil, producing about 78% of its electricity. The government has long been proud of the country ‘green energy’ credentials, even though studies by Philip Fearnside, from INPA (the National Institute of Amazonian Studies) have shown that hydroelectric power stations have their own greenhouse gas problems, as they produce considerable quantities of carbon dioxide and methane — in some cases, more than fossil fuel power plants. The scientists looked not only at projected rainfall as climate change escalates, but at the predicted impact on river flows, because energy generation at hydroelectric power plants depends on how much water is flowing through them. Results suggest that the water flows for the country’s largest four power stations — Itaipu, Furnas, Sobradinho and Tucuruí — will decline from 38% (RCP 4.5) to 57% (RCP 8.5). Brazil has already suffered serious water shortages in the last three years, so this projection is a cause for considerable concern. There are additional reasons for feeling particularly alarmed about what could happen in the Amazon. Brazil has already taken advantage of most of its hydroelectric generation potential in the rest of the country, so the government expects the Amazon basin to play a star role in the future. No fewer than 30 of the 48 dams planned by the government will be situated in the Amazon rainforest. 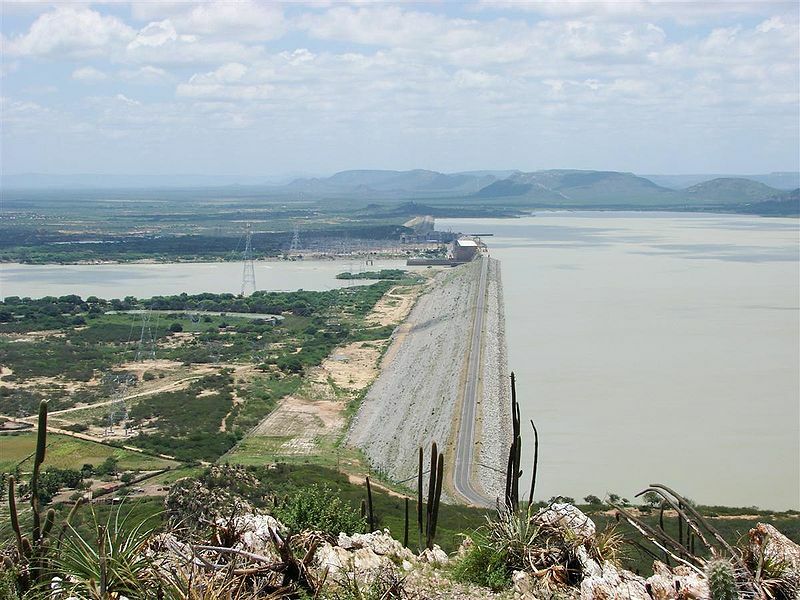 A few of the dams have already been built and the study suggests that all will be seriously impacted. The flow for the Santo Antônio dam on the Madeira river, which flows into the Amazon basin from Bolivia, is expected to fall by 40% (RCP 4.5) or 65% (RCP 8.5). And the flow of the Xingu river in eastern Amazonia, which will feed the giant Belo Monte dam, which is nearing completion, will fall by 25% (RCP 4.5) or 55% (RCP 8.5). There are already grave concerns about Belo Monte’s financial viability, as it is expected to operate at its full capacity for only two months in the year, generating just 4,500 megawatts (MW) out of its installed capacity of 11,233 MW. Further reductions in the river flow would mean that the dam could well become financially untenable. Both the huge outlay of at least US $18 billion and the large-scale damage already inflicted on biodiversity and indigenous and traditional people would have been for nothing. Unless the government rethinks its plans, the same scenario could be repeated in other parts of the Amazon. The simulations suggest that the river flow for the Sāo Luís dam, which is planned for the Tapajós river, could decline from 20% (RCP 4.5) to 30% (RCP 8.5). And elsewhere it could be worse. Unlike the Sāo Luís dam, most new power plants planned for the Amazon utilize run-of-the-river schemes, which means that they use river flows without the construction of large reservoirs. As a result, their electricity generation relies directly on the amount of water flowing in the river at any given time. As in the case of Belo Monte, the flow fluctuates hugely between the dry and rainy seasons so, if the dry season gets longer, the amount of energy generated will be seriously decreased. The report also looks at the impact of climate change in other areas. Particularly hard hit will be agriculture. Some of the country’s main crops could suffer a serious decline in the areas already under cultivation — corn (28%), beans (26%) and rice (24%). Worst affected would be the country’s main export crop — soybeans, with a decline of up to 39%. This could translate into significant financial losses, since the soybean crop currently brings in US $20 billion in export earnings each year. The report relies on simulations, which, of course, can always be wrong. But one conclusion seems certain: Brazil cannot plan for the future based on past assumptions that the climate will essentially remain the same. As Roberto Schaeffer, a scientist involved in the study, told OC: “We can’t do this any more. The future will not necessarily repeat the past.” It is a lesson that other countries will have to learn too, as the world moves into the anthropogenic era — a time of rapid, human triggered, climate disruption.